Fans and pundits wax poetic about ball park, despite teams’ epic losing streak. 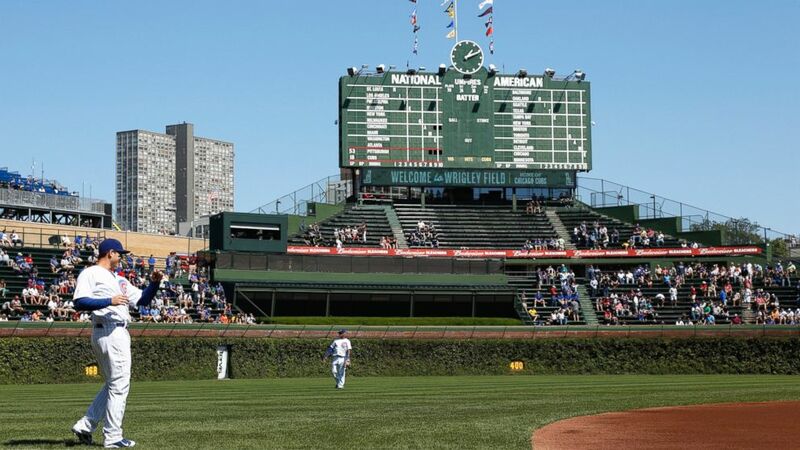 Chicago's Wrigley Field is all about tradition - the ivy, the hand worked scoreboard, the curse of the billy goat - and today on its 100th birthday, the field and its fans will be reveling in that history. Chosen to throw out the first pitch at today's game is Sue Quigg, the grand-niece of former Cubs owner Charles Weeghman -- the field was originally called Weegham Park. And the ball is the same one that her grandmother, Dessa Weeghman, threw a century ago to begin a game between the Chicago Federals and the Kansas City Packers to inaugurate the ball park. Much has changed in the game and the world outside the stadium walls, but park itself, which was rebranded as Wrigley Field in 1926, remains in many ways, untouched. Through several renovations, the steel and brick frame of the original structure remains intact, while the same strain of ivy and manually operated scoreboard constructed in 1937 are among the many charming reminders of bygone days where fans would turn out to games with picnics, drink Old Style ale and chow down on classic Chicago Dogs. Julie Harper of Roanoke, whose father was invited to join first-pitch ceremonies on his 100th birthday earlier this month (but missed it because of agonizing traffic delays), says four generations of her family, farmers from Illinois, have been avid Cubs fans, and there's been little variation since she attended her first game 30 years ago. (Joe Robbins/Getty Images) Players warm up before a game between the Chicago Cubs and Pittsburgh Pirates at Wrigley Field in Chicago, Sept. 14, 2012. Harper, who is her 50s, is among a legion of loyal fans who continue to trek out to the stadium located six miles north of downtown Chicago, despite having never seen the Cubs win a World Series title in their lifetime. The last time the team won the World Series was in 1908, but Wrigley Park has continued to thrive as a cultural and historic landmark through the years. It stands as the second-oldest ballpark in the Major Leagues alongside Fenway Park (the oldest). Both are revered as hallowed ground by ball players, fans and pundits who observe the traditions and hold inauspicious beliefs about the Cubs’ long-held losing streak. The field has also been marked by several moments ingrained indelibly in the minds of those old enough to remember them, and in numerous films and history books that memorialize them. One much-recalled moment is the case of the goat of Wrigley Field. Legend has it that after a man's goat was kicked out of a World Series game in 1945 for being too stinky, the man allegedly threw up his arms and proclaimed that “The Cubs ain’t gonna win no more” World Series. The team lost that day to the Detroit Tigers and never recovered. The curse of the Billy Goat to this day hangs over the heads of stadium workers who never anticipated the decades of hircine-inflicted karma to follow. The field has also be popularized in the public imagination by The Blues Brothers, who gave the stadium’s address to police as their own in their classic 1980 film, while Ferris Bueller also famously went there on his day off six years later in the American coming-of-age flick.